The journey “Pride of The South” indeed starts with the pride of south and the capital of Karnataka. This third largest city of India is, needless to say, ever-bustling and is bestowed with the Victorian architectural marvels and an all-year-round pleasant weather. 1500 Arrive Taj West End to proceed for the check-in formalities at the hotel. 1600 A relaxing strolling in the gardens of the Taj. 1845 A visit to ISKCON will be arranged. 2100 Departure time for The Golden Chariot train for Mysore, dinner will be served on board. On your second day of the trip the train reaches Mysore station, from where you will be boarding a coach that will take you to Kabini Jungle resort. At the resort you will be served food and following that will be enthralling jungle safari to the very famous Kabini National park. In the evening enjoy the camp fire session and stay over-night at the resort. 0800 Enjoy a leisurely breakfast on board. 1000 Reach Amba Villas Mysore Palace. 1115 The coach awaits you to take you to Kabini. 1315 By this time you will reach the Kabini Jungle Lodge Resort. Have lunch in the resort. 1545 The Jungle safari starts. 1945 A wildlife movie will be screened to get you more connected to the aura. 2000 Dinner will be served and camp fire will be set as you will have an overnight stay at the lodge. This day you will board back the coach to Golden Chariot where you will have lunch and then leave for sight-seeing and shopping in and around Srirangapatnam. And your exhaustion will then be cured by graceful cultural dance and scrumptious dinner at 5-star palace hotel and then move back to the Chariot. 0630 Embark on boat safari across the jungles. 0800 Breakfast will be served at the Lodge. 0930 Departure to Mysore after breakfast. 1130 Transfer back to Golden Chariot. 1300 Lunch will be served on board The Golden Chariot. 1530 Sightseeing Srirangapatnam to Tipu museum, Dariya Daulat and fort. 1900 Arrive at the Lalitha Mahal Palace for dinner followed by a cultural performance. 2200 Transfer back to Golden Chariot. The train will leave from Mysore for Hassan where you will visit Shravanabelagola adorned with massive sky-kissing statue of Gommateshvara Bahubali dating back to 978 AD. Then again hop back to the Golden Chariot for lunch and move to Belur and Halebidu to explore the marvelous temple complexes. 0500 The train departs from Mysore to Hassan. 0730 Breakfast will be served. 0900 Sightseeing in Shravanabelagola. There will be 700 steps to be climbed in order to reach the architectural gem, those who are willing can join and others can stay at the Golden Chariot and rejuvenate in spa, gym or restaurants. 1300 Back to the Golden Chariot and the lunch will be served. 1445 Tourists will be taken to Belur and Halebidu to visit the temple complex. 1915 Transfer back to Golden Chariot to relax and enjoy on-board facilities. 2000 Departure time for The Golden Chariot train and dinner will be served on board. The architectural marvel awaits you in Hospet and Hampi. Hampi is dreamy with a tinge of beige and rocks strewn in the landscape. This day you will first visit the best sites of Hospet, like the Hemakuta hills which made its way to the list of World Heritage sites; and then the Vijayvithala Temple in Hampi with a brilliant stone chariot from which the Golden Chariot itself is inspired. The sunset view from the banks of Tungabhadra River is enchanting and rejuvenating, after this you will hop aboard and have dinner. 0700 Breakfast onboard the luxury train. 0830 Depart for sightseeing in Hampi. 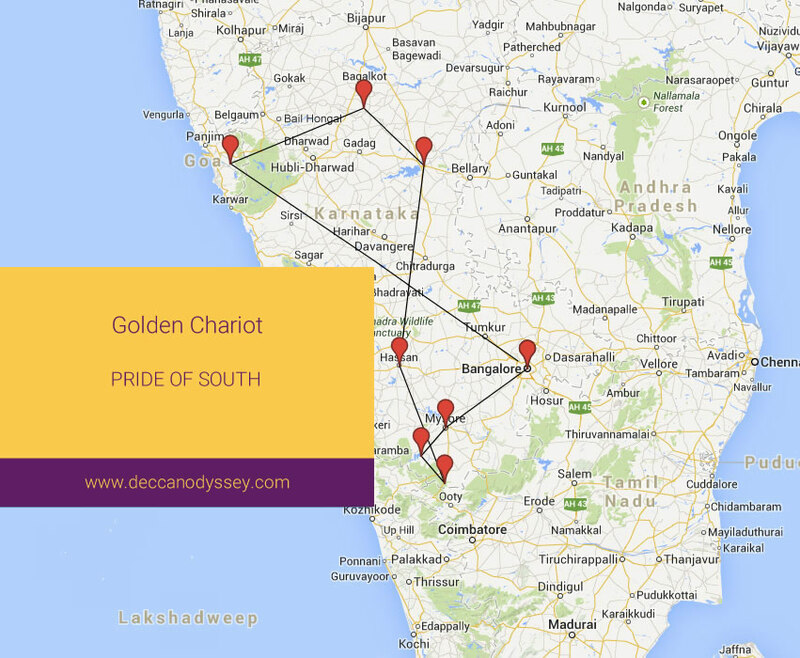 1530 Leave to visit Vijaya Vittala temple (Hampi) and the Stone Chariot which inspired the Golden Chariot. 1700 Enjoy the view of the sunset beside Tungabhadra River. The train will depart from Hospet this morning to reach Badami. Badami, as its name says is related to the color of Badaam (Almond); the Red-stoned edifices and cliffs, totally sets the scene to make the name Badami aptly suitable. On your sixth day of the journey you will visit Pattdakal and Badami caves. After this, you will hop aboard as the lunch is served and the train leaves for Goa. 0400 Golden Chariot leaves for Badami. 0730 Breakfast on board The Golden Chariot. 0840 Sightseeing trip to Badami Caves and Pattadakal. 1330 Lunch will be served on board train. 1400 Departure time for The Golden Chariot train for Goa. Savor the existence of youthfulness in your soul, lose yourselves in the vigorous beaches of Goa and tap your feet to the Goan music. On your seventh day of the trip you will visit Goa and go sight-seeing to the best churches and beaches. 1000 Sightseeing trip across Goa. 1215 Visit the Portuguese Mansion, now converted into an emporium, where you can shop and refresh yourself. 1400 Lunch and afternoon tea will be served in a luxury resort after which you will visit the best beaches of Goa. 1730 Leave from the resort for the Golden Chariot. 1830 Back to the Golden Chariot and soon the train leaves for Bangalore. As you amassed different moments of the journey to create a fairy tale of your own, you will receive warm farewell from the Golden Chariot team in Bangalore. 1130 Reach Yeshwanthpur Railway station and bid adieu to this magical journey.